Aye , we'd likely hear about mass ejection of gases from the vents before we'd hear about any eruptions , the bellowing of gases from the mantle would be detected first right! Is there any chance this a plume as a result of an impact, and not a plume derived from deep within the planet? Good thinking. I was thinking maybe a methane plume? Seems there could be some biological processes going on on ol' rusty after all! "Methane is quickly destroyed in the Martian atmosphere in a variety of ways, so our discovery of substantial plumes of methane in the northern hemisphere of Mars in 2003 indicates some ongoing process is releasing the gas," says lead author Michael Mumma of NASA's Goddard Space Flight Center. "At northern mid-summer, methane is released at a rate comparable to that of the massive hydrocarbon seep at Coal Oil Point in Santa Barbara, Calif."
It's always refreshing to find out more about mars ! A team led by scientists at Caltech and the Jet Propulsion Laboratory (JPL), which Caltech manages for NASA, has calculated that if liquid water exists on Mars, it could -- under specific conditions -- contain more oxygen than previously thought possible. According to the model, the levels could even theoretically exceed the threshold needed to support simple aerobic life. Methane is an invisible gas. But what if the invisible methane were mixed with ice particles and what-nots? 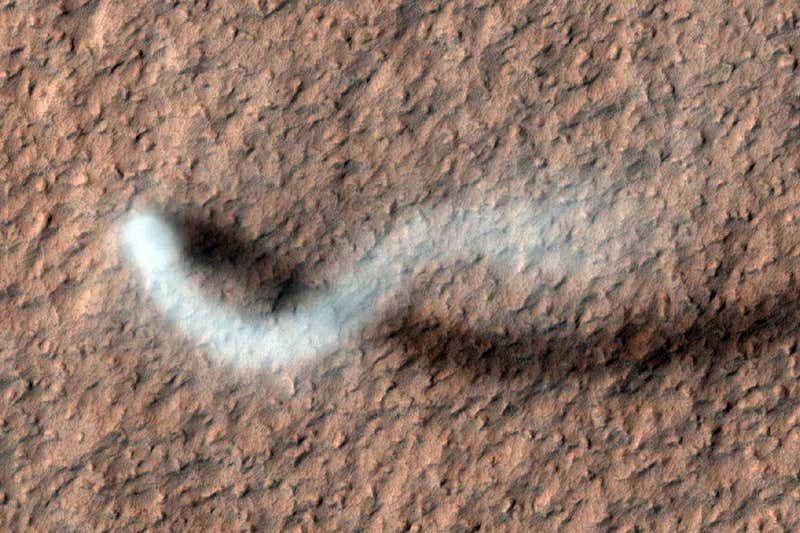 Perhaps a better explanation could be a very large dust devil? Ah that explains it, thanks.